We recap the April 2, 2019 episode. It started with a sprint and ended with a splash. Three teams of 5 contestants were charged with making as many classic trifles as they could in just 20 minutes. They had to jump between stations—whipping cream, cutting out cake layers, crushing graham crackers and layering fruit—to perfect one of chef Ramsay’s childhood favorites. Once time was up, the teams had to gather in jumbo trifle dishes for the reveal of the winning team. Up first, the green team. Their slow and steady work yielded 27 trifles. A pull on the cord overhead revealed that wasn’t enough to win, dousing the team in a river of pudding. The race was tight between the red and yellow teams, with both making a total of 33 trifles—but would they all be perfect? With a tug of the cord, it was revealed that the red team was victorious, beating out the yellow team by just one dish! 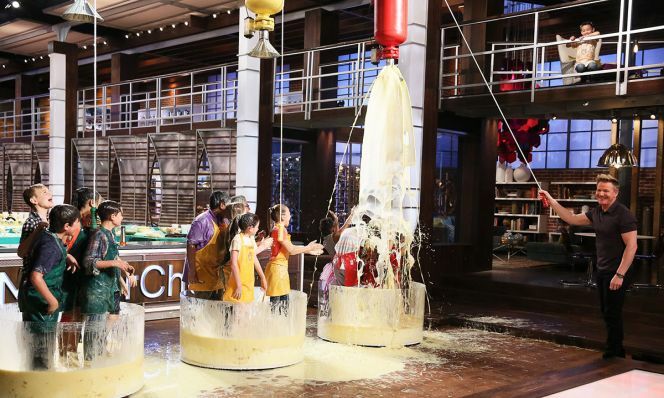 Not to exclude anyone, chef Ramsay then made sure the red team was also covered in pudding. The elimination challenge also addressed another dish very near and dear to chef Ramsay—sliders (he even has a restaurant devoted to them). The bottom 10 contestants had to create their own signature slider…in just 45 minutes. Even with a kitchen as incredibly stocked as the one on the show, sliders in under an hour is a monumental feat. The winner: 11-year-old Ben from Morristown, NJ with his Fried Oyster Sliders. Not only did he come up with this interesting idea from scratch, but he replaced commonly-used breadcrumbs with crushed potato chips to hold the mixture together. The slider’s crunchy coating and coleslaw topper contrasted with the soft brioche bun and creamy mayo. Genius! Sadly, two contestants were sent home, so tune in to FOX next Tuesday at 8pm Eastern to see what the remaining contestants have on their plates.